I’ll be honest, until I saw this I believed that we, the church, had in one way or another reached every corner of the world. I thought there was someone teaching, preaching, and living in Christ in every sector of the world showing God’s love and saving the lost. Let that sink in for a minute. I mean, we live in the digital age where anything you want is at your fingertips. You can impact people in other countries without ever leaving your living room. There are hundreds of thousands of Christian missionaries on the field at any given moment, and this doesn’t even take into account all of the short-term missionary trips. No longer can we think that this is it a world where people are just choosing to not accept Christ. But this is a world where there are people who truly do not know there is a Savior to save them. People who do not know there is a Living God who sent his SON to DIE so that we may LIVE. This is a world where there is no hope. This wall should be filled by now…. When I first saw the wall Thursday night, after realizing just what it was conveying I thought “well this is the just the first night. Not everyone has shown up for the conference yet, but I’m sure by the end of the weekend it will be full. After all, that’s what we are all here for: to spread the Good News to the whole world.” This wall should be filled by now…. After all they weren’t asking for much, just for you to select a people group and a country and PRAY. That’s it. Just pray for them. No one at the booth was asking you to send them money; no one asking for you to sign up to go there; just pray. This wall should be filled by now…. Friday passed. Saturday passed. Sunday arrived. The last day of this conference that has brought together so many with the same goal of reaching the lost; the last day for someone to take a few short minutes to say I want these people to be reached. And this wall was not filled. When I left Sunday the wall was not filled. Every spot should have been filled and prayed for but there were still large gaps left blank. I started feeling sad then I realized that people were still adding their prayers to the wall. There were blank spaces waiting for that sticky note to be placed but there were so many that had someone willing to pray for those people, someone who like me had not known of these people groups before. 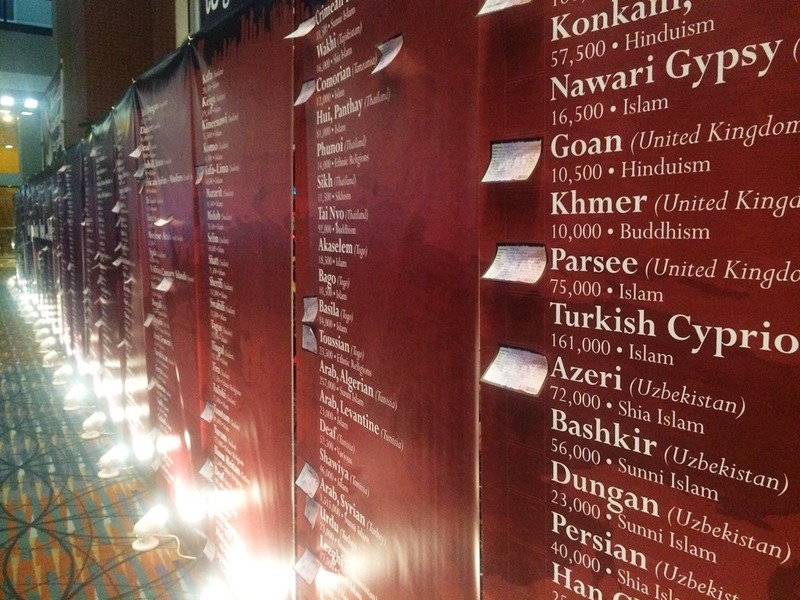 It could have been very easy to be discouraged by the number of blank spots on that wall; to know how many people groups are still waiting hungrily to hear the saving words and drink the life giving water; but look at how many more people groups now have someone praying for them! Before I saw this wall I wasn’t praying for those people. I was praying for the ones where missionaries that had crossed my path in the past were located. I never realized that there is no one reaching the deaf in Laos; or the Central Thai in Myanmar; or the Bosniak in Montengro. Honestly I had never heard of several of those places and I like to consider myself educated and well-read. For those of you that volunteer to help raise awareness don’t lose hope because that wall is not filled. Rejoice for the ones that now have someone praying over them. For those of you that filled out that prayer note with a people group and country, pray hard for those people. Prayer really does work and with the Holy Spirit nothing is impossible. Your prayers may light a spark in the heart of a college student deciding where they want to do mission work. Your prayers may settle in the soul of people who can fund those missionaries. Your prayers may even open the hearts and minds of that people group so the Holy Spirit can plant that curiosity about the Living God so when they hear the word they will know it’s truth. Every step we take towards filling that wall is a step towards emptying it. 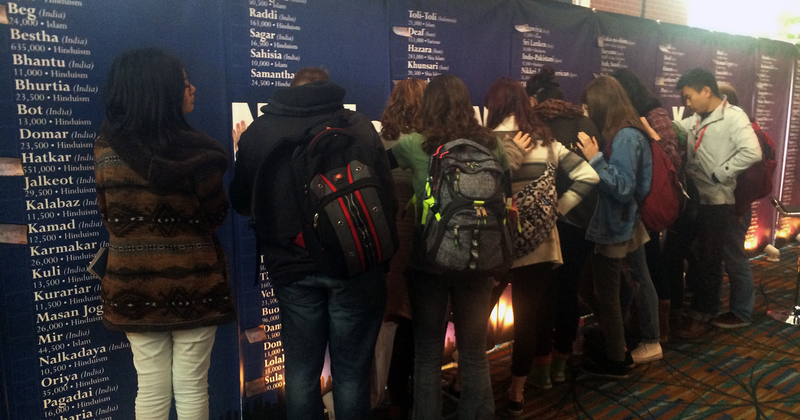 One day we will reach every people group, but until then we can rejoice for each new prayer added to the wall. By nature Heather Allen is an introvert who finally realized that God never intended for her to stay in her safety zone. So now she talks to anyone and everyone, willingly sharing her story of how Christ has impacted her life. She uses this new talent to encourage others to continue their walk with the Lord and as a "call to action" to be the people God wants us to be. She currently resides in Roanoke, Virginia with her two sons.